God has a Divine Plan for his World - Creation . . . Eden . . . the Fall . . . God's choosing of his people to be his instruments of blessing . . . the historical experiences of the "chosen ones" from Abraham through the Exile -- All give evidence that God has a divine purpose for his world. We have been doing more than studying the history of Israel. We have been watching the purpose of God unfold in historical experiences of this people and hence acquanting ourselves with God's will for his world. 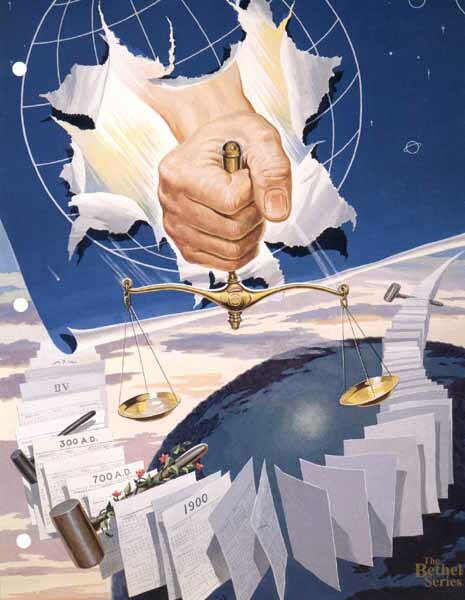 Justice and Judgment - One theme has occurred and reoccurred while learning about divine purpose and will: Justice must prevail in the Father's world. It is his purpose to bring it about. From Genesis to Malachi, we see the Creator as a God of love who is jeolously concerned over the welfare of his children. God will permit no person or nation to exploit that creature whom he has fashioned after his own likeness. As persons or nations violate God's will at this juncture, they are judged. But how and when does judgment come? And what is its purpose? People are Judged Beyond the Grave - The Bible clearly declares that beyond the vale of death, every person shall keep an appointment before the judgment seat of God, and there will be asked to give an account of his or her life. Judgment is Also Administered in the Present - Those who pursue unrighteousness bring unrighteousness upon themselves. Those who chase trouble end up in the midst of it. Our actions judge us, not in the far-distant future, but in the present. We bring back upon ourselves either the good of our deeds or the evil of them. History Itself is the Judgment of God - God is not merely a spectator in the arena of human affairs. God calls for obedience to his will and dedication to his purpose. If a person or nation does not abide by that will or conform to that purpose, God uses historical events as his instrument of judgment. It is in this sense that the Bible speaks of history itself is the judgment of God. NEGATIVE - The chastening hand of God brings pain. God will not permit the unholy ambitions of a few to jeopardize the good things which belong to the many. God is not a sentimentalist who loves so little that he never rebukes. Yes, judgment has its negative aspect in that God must sometimes use it for condemnation. to deter his people from making treasures out of trinkets and trinkets out of treasures. to protect the constructive values in the world from deterioration and decay. to purify, to purge, and to redeem life that stands in peril of being lost. to save his children from walking headlong into the arms of eternal death. This was Israel's understanding of judgment and it is the understanding of the communion of saints who follow the Redeemer called Christ. God had judged, he judges now, and he will judge because he loves! Globe on blueprint - God has a divine plan for his world. Hand crashes through blueprint - Hand of God. Hand holds scales of justice - God's message asserts that justice must prevail. Insofar as persons on nations violate the moral law of the universe, they are judged. Small gavel beyond surface of globe (center right) - All are judged beyond the grave. Two gavels set between calendars (lower left) - Judgment is also administered in the time in which we live. History itself is the judgment of God. Small gavel by 300 A.D. calendar - Judgment has its negative aspect in that God must sometimes use it for condemnation. Large gavel by 700 A.D. calendar - Judgment has its positive aspect in that it is administered to protect all constructive values from deterioration and decay. Flowers on large gavel - God administers judgment because of his love for all people.